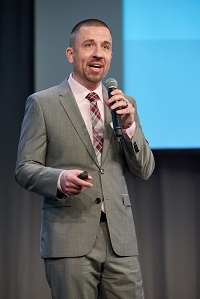 On Tuesday, May 2, the Social Innovation Forum (SIF) welcomed more than 350 philanthropists, business leaders, and others to the 14th Annual Social Innovator Showcase to hear seven of greater Boston’s nonprofit organizations pitch their solutions to our community's toughest social issues. SIF Executive Director Susan Musinsky gave opening remarks to a standing room only crowd at MIT. She then turned the stage over to the Innovators, who just completed the first six-months of SIF’s nonprofit accelerator, where they worked with a cadre of consultants, coaches, volunteers, and in-kind partners to prepare a five-minute pitch to effectively articulate their vision, mission, and goals to a wider audience. Each of these Social Innovators presented ambitious two-year plans to expand their work and grow their impact, inviting the audience members to join them in this work. Robyn Carter of Room to Grow kicked off the Innovator presentations with the sobering statistic that that 1 in 3 babies are born into poverty in Boston and nearly half of them will remain there as adults. Room to Grow’s two-generational model breaks this cycle by working with mothers and children, providing both services and material goods, and is seeking a $500,000 investment to double the number of families it serves over the next two years. Charles Lerner of Boston CASA highlighted the limitations of a child welfare system in which 1,830 children were involved with the Suffolk County Juvenile Court due to abuse or neglect, and just under 10% of them were assigned a CASA, or “Court Appointed Special Advocate.” Charles argued that, “we have accepted marginal care for these children for way too long,” and shared his plans to increase the number of children Boston CASA serves by 20% over two years, providing even more vulnerable children with designated advocate to support their interests in the complex child welfare system. Corinn Williams of Community Economic Development Center shared the story of New Bedford, a community only an hour away from Boston yet one of the poorest urban areas in Massachusetts. CEDC is “building bridges to economic opportunity” for residents of New Bedford’s Near North End, where almost half of households live in poverty. CEDC seeks to raise $550,000 over two years to help residents and small businesses become more self-sufficient, active participants in the local economy and more effective advocates for themselves in the public sector. Naoka Carey of Citizens for Juvenile Justice shared a picture of a juvenile justice system that “breaks the young people that enter it,” leaving them more likely to drop out of high school, less likely to find a job, and more likely to commit future crimes. CfJJ advocates for a justice system that is fair and effective, that helps kids grow up into responsible adults, and invests in programs that actually work. CFJJ seeks an investment of $1.5M over two years to expand its research and public education portfolio and increase its staff to include full-time development and grassroots organization capacity, among other initiatives. Yolanda Coentro of the Institute for Nonprofit Practice told the audience that the social sector is facing a leadership deficit: 78% of New England nonprofit executives planning to leave their jobs before 2020 and only one third of those feel there is adequate bench strength to succeed them. INP, which provides diverse nonprofit executives and emerging leaders the skills, confidence, and resources they need to build strong, effective organizations, seeks an investment of $3.6M over two years in order to expand operations and establish the foundation to double the number of leaders served by 2022 and continue replication into other regions. Bob Monahan of Julie’s Family Learning Center shared his organization’s high-touch, comprehensive, multi-generational approach to supporting mothers and children dealing with poverty and its related issues, such as homelessness, addiction, and abuse. 100% of children from Julie’s enter first grade above grade level. Julie’s is seeking an investment of $3.3M over the next two years in order to reach 200 more families. Veronica Serrato of Project Citizenship noted that while Massachusetts and Boston have the 7th largest concentration of immigrants in the U.S., lack of knowledge about how the process works and high legal fees have left many unable to gain access to citizenship. Project Citizenship seeks an investment of $1.4M to meet the increased demand for its services and help 10,000 immigrants achieve U.S. citizenship by 2019. The event was sponsored by John Hancock, Marcus Partners, Nutter, Reynders McVeigh Capital Management, Choate Investment Advisors, Eastern Bank, RINET, DavisKelly CPAs, and Delta Dental of MA. Download the 2017 Social Impact Investment Guide from the Showcase. Our Innovators will be presenting once again on June 14 from 8:30 am – 10:00 am at Brown Rudnick in downtown Boston at a “Second Look” event. The event is a great opportunity for those who missed the Showcase to meet our Innovators and hear their presentations. Please visit our Second Look page for more information or to RSVP.